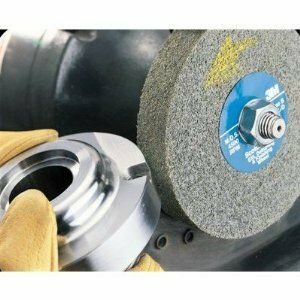 Mercer Industries 396GRY Surface Prep Wheels Type 27 Grey/Ultra-Fine (10 Pack), 4-1/2" x 7/8"
The Mercer Industries Surface Prep Wheel is made from non-woven synthetic fiber impregnated with Silicon Carbide grain. It will not rust or oxide. Designed to prevent snagging and tearing during use. Wheel can be used with water or solvents. Maximize efficiency by using 100% of the wheel. Mercer Industries is a 3rd generation family owned company that was built on core values of Quality, Performance, Delivery, Service, and Price. Founded in 1968, Mercer Industries offers more than 3,000 products for the flooring, industrial, automotive and welding markets. Mercer, formerly known as Mercer Abrasives, is committed to serving its customers and providing quality products. For more information, visit mercer industries dot com. We're here to support you. Please contact our team at info at mercer industries dot com with questions or comments. Claims for warranty must be made within 90 days of the date of purchase. Proof of purchase required. This warranty does not cover any product that has been subject to misuse, neglect, negligence or accident, or that has been used in any way contrary to the purpose intended. Easily removes paint, stains, adhesives, weld burn, rust and other surface contaminants from large areas. Works on right angle tools quickly and easily with little or no pressure. 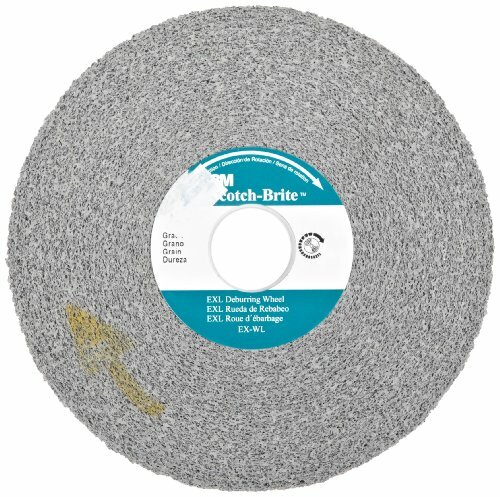 3M Scotch-Brite XL-UW unitized deburring wheel uses silicon carbide as the abrasive material and has a diameter of 6 in. The arbor attachment allows for easy mounting to the tool or pad. In addition to the other aspects of these parts, another important component of these is the thickness. This 3M part is 1/2 in thick. All abrasive products that rotate or spin, such as the ones in this category, have a maximum speed at which you can run them. This 3M deburring wheel can be run at a maximum speed of 5000 RPMs. 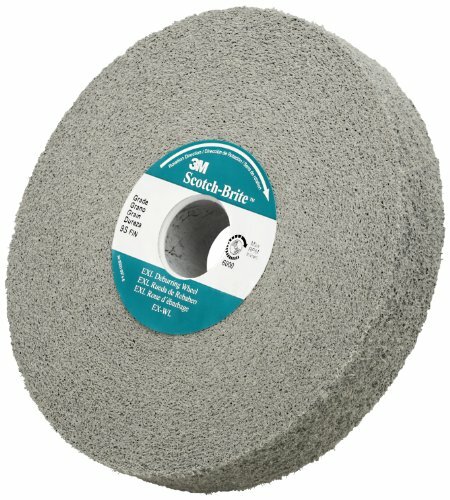 The Scotch-Brite EXL PRO Deburring Wheel excels at deburring and is an ideal fit for off-hand operations. It provides 30-50% longer life than the original EXL wheel, without sacrificing a smooth feel and conformability. Designed for optimal operator comfort, the EXL PRO wheel requires less pressure for a faster cut, making this the wheel of choice for premium performance. 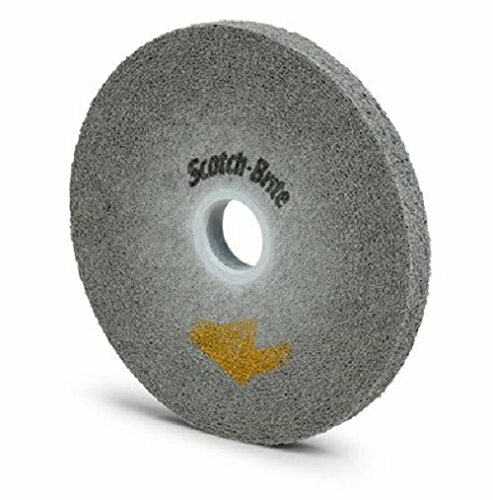 Optimal Scotch-Brite Wheel performance for deburring, finishing and polishing applications on any metal or most other materials. Convolutely wound on a core. Soft yet durable 9 density. Abrasive mineral: Fine grade silicon carbide. 405-048011-05135 Features: -High performance and durability. -Convolutely wound on a core. -Mounting: Arbor Hole. -Color Code: Gray. 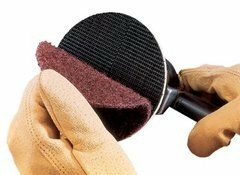 Product Type: -Non Woven Abrasives. Dimensions: Overall Product Weight: -1.2 Pounds. An excellent choice in jewelry repair work for its ability to wipe off scratches and scuff marks on precious metals. 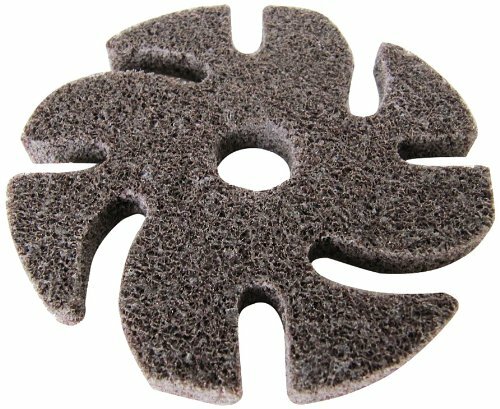 It is great for removing porosity and parting lines in jewelry castings. 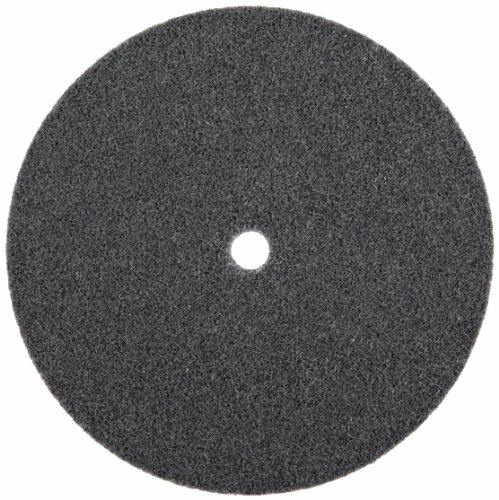 This abrasive is ideal for deburring and polishing of all metal alloys as well as many plastics and composites. The material consists of aluminum oxide impregnated in a non woven web, which resists loading and has an extremely long life. They resist smearing and minimize heat buildup on the work piece. Grit medium. Size: 3" diameter. High performance and durability for deburring and finishing applications. Convolutely wound on a core. Hard, durable 9 density. Abrasive mineral: fine grade silicon carbide. 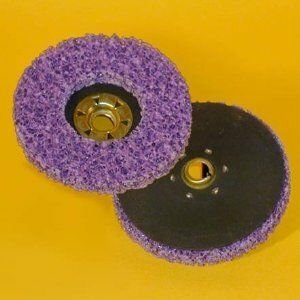 EXL wheel are excellent for deburring and polishing. Industry standard for deburring and finishing. Center hole diameter: 1". Density: 9. Grade: Fine. Max RPM: 6000. 6" Diameter. 1" Width. Gray color. 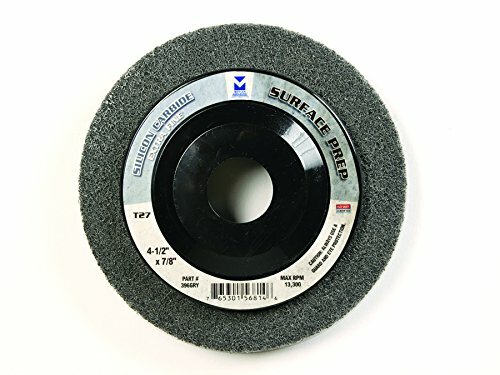 Longest lasting wheel in the EXL line offers high cut rate and smooth running for demanding deburring, polishing and finishing Works on all metals, composites, glass while delivering the same superior finish and consistency as Scotch-Brite EXL family of wheels Exposed mineral produces less smearing, reducing time spent cleaning and prepping surfaces Minimizes heat build up to lessen impact on heat-sensitive materials New technology maintains wheel conformability, offers superior edge retention, and resists "chunking"
Tough non-woven disc aggressively deburrs and finishes. Open-web construction resists loading and runs cool. Conforms well to help preserve irregular or contoured surfaces. 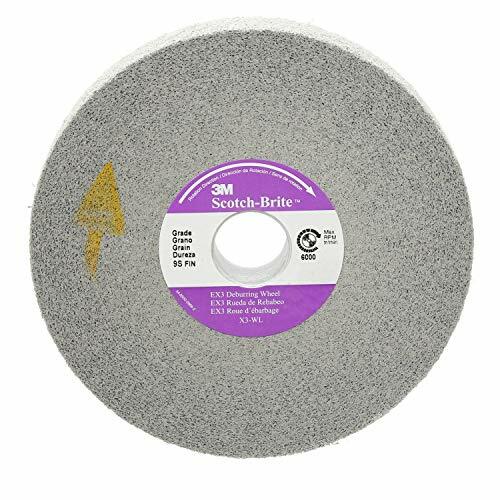 3M Scotch-Brite CX-DN deburring disc uses silicon carbide as the abrasive material and has a diameter of 4 1/2 in. 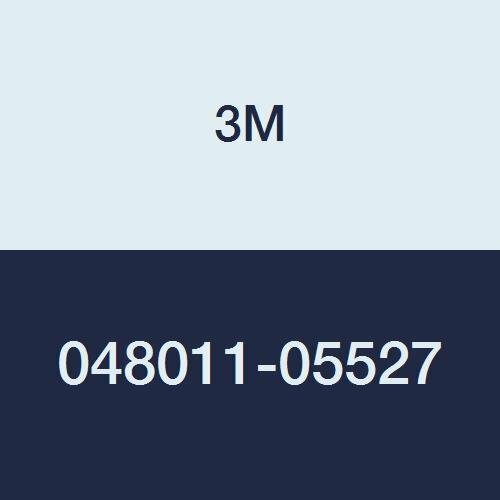 Since this product is non-woven, grade is generally used to describe the abrasiveness; with the 33194 having a very coarse grade. 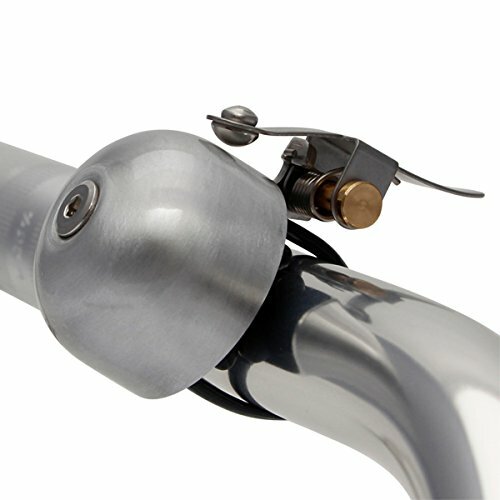 The threaded arbor attachment allows for easy mounting to the tool or pad. 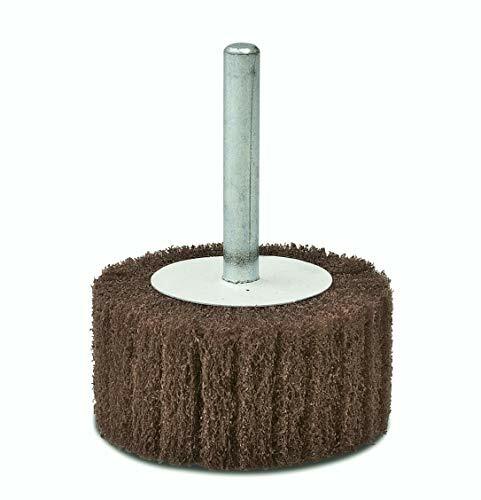 All abrasive products that rotate or spin, such as the ones in this category, have a maximum speed at which you can run them. 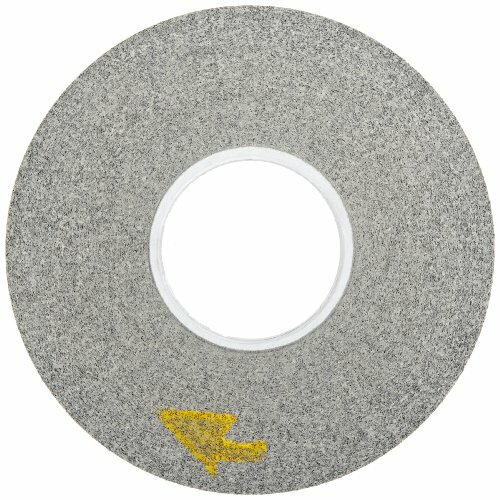 This 3M deburring disc can be run at a maximum speed of 13300 RPMs. Attach and remove easily to 3M hook & loop backup pads. Used with the following hand tools: right angle, random orbital, and dual action . 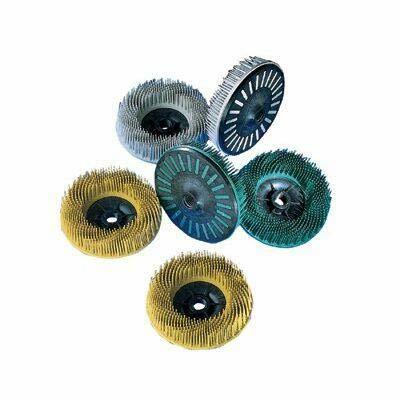 This flap wheel has elastic grain-coated Nylon web for shadow-free tarnishing, glazing and polishing of special steel and non-ferrous metals. 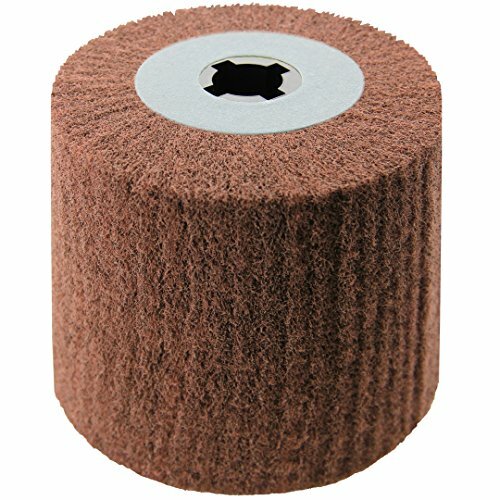 100% non woven Aluminum Oxide flap wheels provide excellent flexibility and conforms to work surface. Long lusting tool can be used on die grinder. Made in USA. 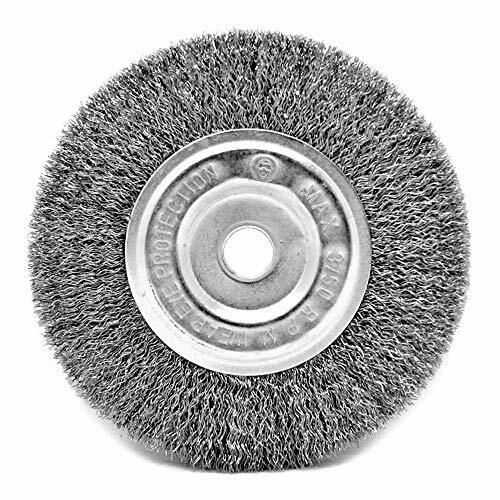 3M Scotch-Brite LD-WL convolute deburring wheel uses silicon carbide as the abrasive material and has a diameter of 8 in. The arbor attachment allows for easy mounting to the tool or pad. In addition to the other aspects of these parts, another important component of these is the thickness. This 3M part is 1 in thick. 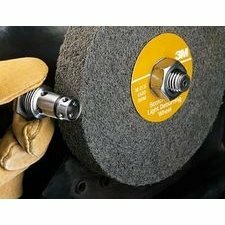 All abrasive products that rotate or spin, such as the ones in this category, have a maximum speed at which you can run them. This 3M deburring wheel can be run at a maximum speed of 4500 RPMs.